The good we secure for ourselves is precarious and uncertain until it is secured for all of us and incorporated into our common life. from the award-winning documentary, playing for change: peace through music. the following song is a cover of stand by me, the ben e. king classic, performed by a variety of musicians around the world who each sang a part of the song as it traveled the globe. Wow! What a brilliant piece of videography! And of course it only drives the message home that much more - people from the far corners of the earth joined together by technology to create a beautiful piece of music. Did you ever get to see the DVD 1 Giant Leap? Same idea, 2 guys with a digital videocam, a mic, and a MacBook traveling the world and putting together an amazing multimedia event. I will be back to listen . . . 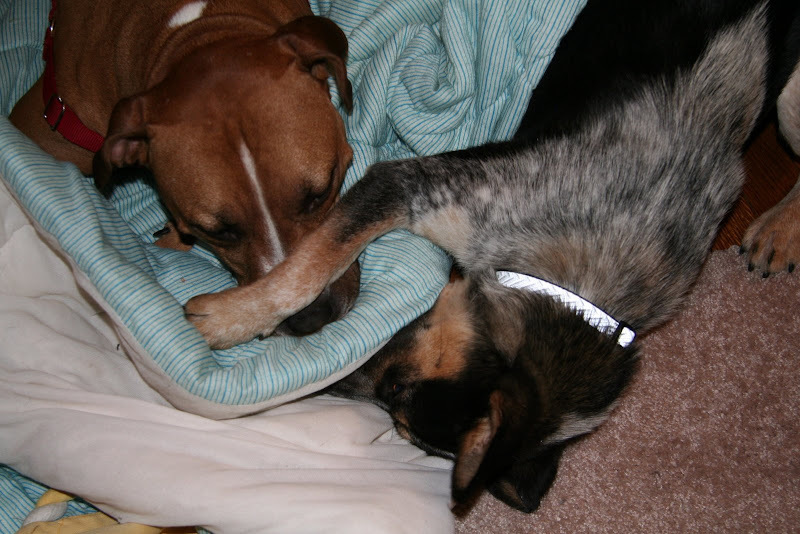 The puppy love photo makes me smile, because I have two kittens who alternately tussle and share a love fest. Unfortunately, I couldn't listen to the sound, because the kittens have somehow disconnected the media/speakers on my computer system. Oops! The film link and the vid. Are. GREAT. and the bonus points for me? Seeing Grandpa Elliott, alive and kicking in NOLA. We took photos of him when we were there before Katrina. He was always one of the people whose fate I wondered about. roy - thanks for the link to 1 giant leap....I hadn't heard of this project before (least not that I remember) WOW....it's terrific!!! I want to locate the film...happy to see clips, some of my favorite musicians....I wonder if duncan and jamie are looking for any helpers for their next project!! tut - make sure you do, you are gonna love it.... talk about a piece that touches your soul/heart! rlb - wow that's amazing that you took pics of grandpa elliot! he's looking good and sounding great! That was amazing! Its nice to be randomly surfing the net then to stumble across something like this that really catches your heart. Thanks for posting! That was incredible, fantastic. Thank you! Such a moving and inspiring piece of ART! Wow, what a wonderful quote that was at the start of your blog. I often feel what small gains I make for myself are undone by the ignorant actions of the rest of the world. Common ground is where it begins. Kim, the DVD for 1 Giant Leap is available on Amazon.com. Seeing it on DVD gives you a lot more interactivity between the segments, back story, background info, etc., plus gives you a "random" option that just plays the disc in whatever order the program decides. Thinking I should probably link to this post on Tuesday...cause we get to be sentimental & inspired that day, right? Do you want a unique t-shirt? fore me has stated, that was a fantastic video. How can you not love Grandpa Elliot. Thanks for the moving music..I randomly found this on youtube about 2 weeks ago but didnt think of posting and sharing it. I may do that also. I loved it. Thankyou for that, so uplifting! I see also that I think that is a Blue Heeler cattle dog in the large image? We like them very much in our house.....for obvious reasons! Rather than leaving a profound comment about the wonderful video, I have to comment that I too have a dog, part Australian cattle dog, named Matilda. I heard the video and it is a beautiful tapestry of universal brotherhood to me. We have an ever so delicate tapestry and fragile. It can unravel with the actions of just a few as only a few can light a candle that curses the darkness. When young, I listened to the Christophers, "It is better to light one candle than to curse the darkness".Jane Addams comment is so true. I can but say that the actions of a few saved many lives over a million in the WWII era. Read about the life of Julien Burel the Carmelite Father and about Irena Sendler of Warsaw. Such people really exist today as well as then.